The automotive industry is an engine of growth for the Indian economy. The auto component industry contributes 2.3% to National GDP, providing direct employment to 1.5 million people. The 'Make in India' campaign of the government has enthused the entire manufacturing sector. Focus on ease of doing business, implementation of GST and other reforms augur well for the component manufacturing industry. While the last year had significant challenges for the sector, the component industry fared reasonably well with exports scaling to USD 13.5 billion and an overall turnover of USD 51.2 billon. Aimed at an holistic growth model for the automotive industry, The Automotive Mission Plan (AMP 2026) has set a target of a turnover of USD 200 billion by 2026 for the auto component sector backed with strong exports ranging between USD 70 -80 billion. This year we have adopted 'Auto Component Industry in India – Preparing for the Future' as our theme for the year 2018-19 and Industry needs to start viewing it with an action-oriented lens. In order to succeed, the Government and the automotive industry need to form a long-term and consistent policy with futuristic focus. ACMA would endeavor to focus on strengthening it’s members' capabilities for new product development, improving quality standards, evolving technology for meeting the evolving emission and safety standards, upgrading people skills to support domestic and global expansion. The auto-component industry in India is today entering a new phase in terms of global exposure and adoption of technology. The priorities for the future would be to put much greater focus on R&D, to help generate intellectual property in India where world class production quality will be a given. It is important to acknowledge that a transformation is round the corner and we will have to gear up to it. This calls for a more collaborative approach between the various stakeholders of the value chain i.e. component manufacturers, OEMs, Machine Tool Suppliers, the Raw Material industry and the Government. I am confident that as an industry we will rise to the challenges and with the support of all stakeholders, firmly build on the global-quality manufacturing ethos that we have already established in the last few decades. Today, the Indian auto component industry is well recognised globally with deep forward and backward linkages with several key segments of the economy. With the clarion call to ‘Make in India’ by our Hon’ble Prime Minister, the virtuous cycle of manufacturing is all set to roll. The campaign aspires to bolster domestic manufacturing by facilitating investment, fostering innovation, enhancing skill development, protecting intellectual property and building best in class manufacturing infrastructure in the country. To help the auto component industry, the government has announced a slew a reforms in the Budget 2015 and the Foreign Trade Policy 2015. Forward looking policy measures such as announcement of introduction of GST, consolidation of various exports schemes, simplification of procedures to help integrate India into the global value chain, improving ease of doing business index through online and e-governance interventions and reducing the transaction costs augur well for the industry. 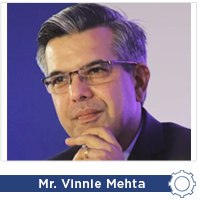 With reforms gathering momentum, the growth in the automotive industry is imminent, however we need to ensure that the industry, especially our tier-2 and tier-3 are ready for the next growth cycle. That apart focus on innovation and R&D are critical to help the industry leap frog to the next level. Going forward, we envision of making India into a global export hub because of our inherent strengths of frugal engineering, cost advantages and quality benefits that India can provide to the rest of the world. With this vision in place the auto component industry is all set to be the engine for India’s economic growth.